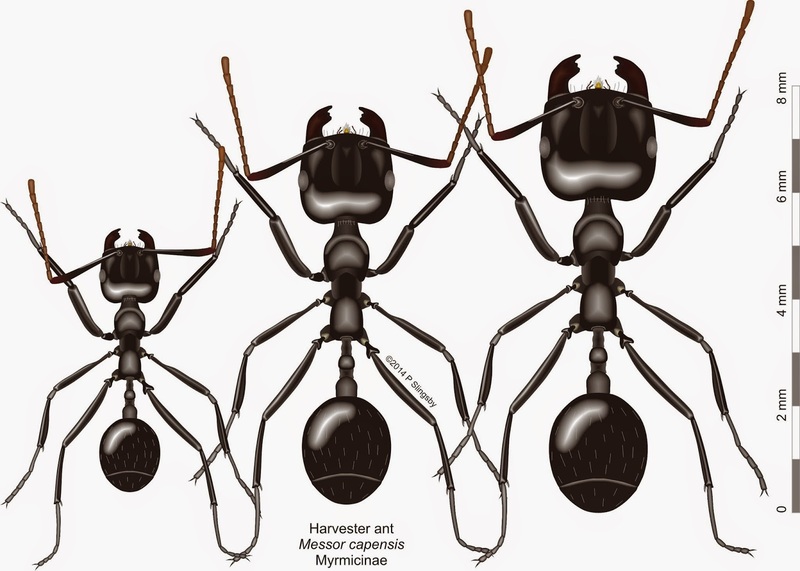 Messor was the Roman god of crops and harvest; the word also means ‘reaper’ in Latin – hence an appropriate name for these ants, as they are almost exclusively granivores, ie seed eaters. There are about 100 species distributed over Africa, western Asia and southern Europe. In Africa they occur in savannah and semi-desert areas such as the Karoo. Their nests are built directly into the ground with a crater-like entrance. The colonies can be large, and they construct intricate granaries in which to store seeds in dry conditions, so that the seeds do not germinate. Often distinct foraging paths lead to and from the nest, and the ants return from foraging along distinct trails carrying seeds and other vegetable matter. They are mainly active on warm evenings and during the night, and the large majors can inflict a painful bite. They’re slow-moving ants that often ‘freeze’ into immobility if disturbed. Most Messor species are strongly polymorphic, with a range of workers in continuous sizes from small to large. The larger they are, the heads become disproportionately larger and the mandibles have fewer and fewer ‘teeth’; the largest workers are thus designed as ‘nutcrackers’ to break open tough seed cases. All the workers have a ‘psammaphore’ or basket-like set of bristles beneath their heads, which is apparently used to carry sand grains from their nests. They do not have much in the way of spines on the propodeum, but some species may have a pair of blunt tubercles. There are seven species in our region, but some myrmecologists think that three of these are merely variations within the same species. The species are listed below in declining sizes, using the size of the largest major workers. This is the largest Messor in our region, with workers ranging in size from 6.5 to 12 mm. The sides of the head are conspicuously evenly convex or rounded, especially in the largest majors, and this characteristic distinguishes the species from all others. The ants’ profile is relatively long and low. They are medium to dark brown, with the gaster often a darker brown. All dorsal surfaces of the head and body have numerous standing hairs, and these are evenly distributed on the first segment of the gaster. The species name means ‘striped forehead’, from the striate nature of the ants’ heads. This is a dry country species, restricted to the Western and Northern Cape and Namibia. Typical nest entrance of Messor striatifrons, though in some seasons they disappear altogether. We don’t know where they go! The workers range in size from 7 to 11 mm. The ants are all-over red or red-brown except the gaster, which can be dark brown. The centre of the clypeus below the frontal lobes has a distinctive raised ‘welt’ [magnification needed]. The propodeum sometimes has two blunt ‘teeth’. All dorsal surfaces of the head and body have numerous conspicuous erect hairs. The eyes are quite large, but not as big as in M. denticornis. From Namibia and Angola only; the name means ‘from the jungle or forest’ which is quite inappropriate. No pics at this stage. Workers range in size from 5.5 to 11 mm. M. denticornis are relatively slender with relatively smaller heads than in other species; the eyes are large and convex [bulging]. The base of the scape has a small raised tooth on the outer edge. The ants are more or less uniform dark brown or brownish-red, with appendages lighter to yellowish and short, sparse, reddish pilosity; the gaster is shiny. The clypeus with distinct step [magnification needed] and there is a distinctive fringe of long, red hairs on the anterior margin of the clypeus. The ants have two blunt spines or ‘horns’ on the propodeum [back end of thorax] – these are the ‘horny teeth’ that the species name (denticornis) refers to. 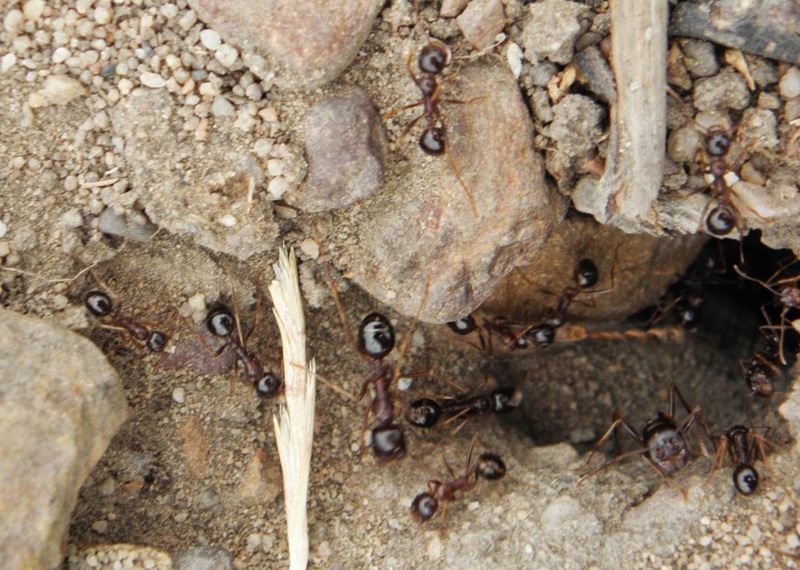 The ants are commonest in the drier areas of the Eastern, Northern and Western Cape, as well as in Botswana and Namibia. They are very similar to M. capensis in overall appearance. Workers are from 5 to 11 mm in size. The head of the major workers can be brown to black, more or less the same colour as the alitrunk [thorax] and gaster; minors can be brown with yellow-brown flagellum, or, in the extreme west, dark brown to black. The head is closely striate [longitudinal ‘wrinkles’ or creases] with an overall silky gloss; the gaster smooth and shiny. Moderate yellowish pilosity, which also occurs on the legs. Minors have up to 12 teeth on striate mandibles, while the largest majors have mandibles without teeth. The nest entrances of this species, as with many of the others, can form considerable mounds of loose, excavated sand. This is the commonest Messor in our region, occurring in all provinces of South Africa as well as Botswana, Lesotho and Zimbabwe. ‘Capensis’ simply means ‘from the Cape’. 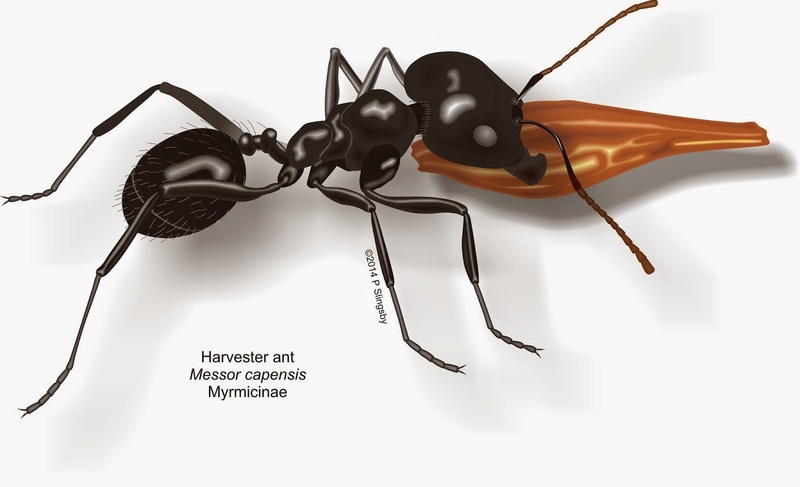 Workers are in a narrower range than M. capensis, from 7 to 10 mm. The colour is a deep red-brown to black, with a distinctive deep red-brown to black pilosity all over the body. Occurs in all South African provinces except the Eastern and Western Cape, as well as in Botswana. The specific name ‘piceus’ means ‘pitch black’. It has been suggested that this ant is merely a variety of M. capensis, and not a different species. The workers are between 4.5 and 9 mm in length. The majors have red heads and dark red alitrunk [thorax], while the gaster might be darker still. The minors may be black all over. The heads of the majors are wider by up to 20% than they are long. M. decipiens occurs in the central/eastern provinces of South Africa [KZN, Mpumalanga, Free State and Limpopo] as well as Botswana, Lesotho and Zimbabwe. 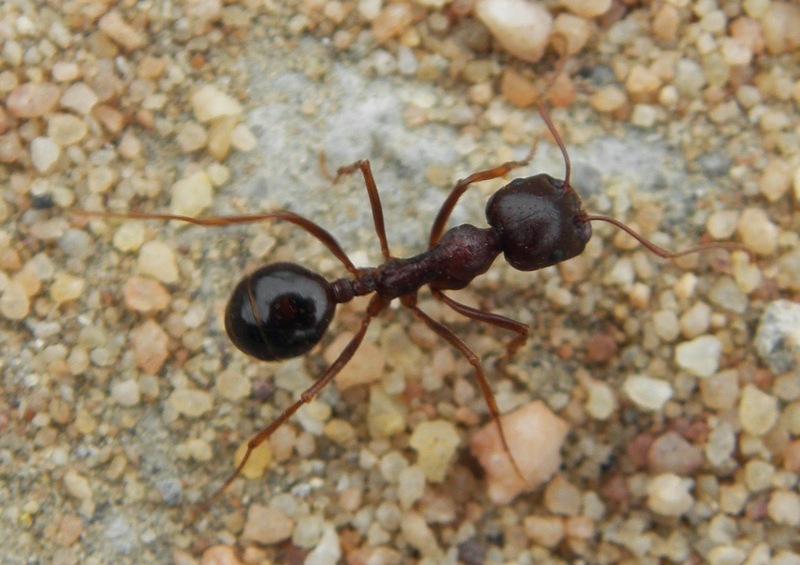 The specific name ‘decipiens’ means ‘deceiving’; as it has been suggested that this ant is merely a variety of M. capensis, and not a different species, the name might be appropriate. This the smallest of our local species, with workers from 5 to 8 mm. The heads of the majors are robust, wider than long, and finely striate [grooved]. All workers are red, with the posterior two-thirds of the gaster a dark brown. The antennae and legs are reddish brown, and there are two blunt, ridge-like tubercles on the propodeum. The pilosity is much reduced compared to other Messor in our region, but with mild pubescence on the legs and antennal scapes. The ants are extremely widespread in the southern half of Africa from Tanzania, through Zimbabwe to Botswana and Namibia; in South Africa only recorded from the Northern Cape, Limpopo and Gauteng. The species is named after Luebbert, who first collected the species in German South West Africa in 1909. Whoever authored the information for this website is wonderful!!! Beautifully written, incredibly well researched, insightful, educational and fascinating! Thank you for all your work! Strange that the old world Harvesters don't appear to be able to sting because the new world species such as Pogonomyrmex barbatus certainly do and have a painful one to boot. The old world and new world harvesters appear very similar, so what happened to the sting with the old world harvesters? Or are we looking at completely different ants that just happen to share the same habits and same appearance. That would be an interesting area to study.